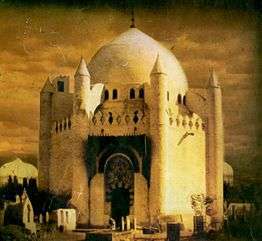 The tomb of Al-Baqi', destroyed in 1925; Imam Muhammad al-Baqir is one of four Shiite imams buried there. Muḥammad al-Bāqir (Arabic: محمد الباقر‎‎) (676–733 AD) (also called Abu Ja'far) (known as al-Baqir; the one who opens knowledge) (full name Muhammad bin 'Ali bin al-Husayn bin Ali bin Abi Talib) was the fifth Shia imam, succeeding his father Zayn al-Abidin and succeeded by his son Ja'far al-Sadiq. He was the first imam descended from both grandsons of Muhammad: Hasan ibn Ali and Husayn ibn Ali. He is revered by Shiite Muslims for his religious leadership, and respected by Sunni Muslims for his knowledge and Islamic scholarship as a jurist in Medina. Al-Baqir had a prominent lineage, his paternal and maternal grandfathers, Husayn ibn Ali and Hasan ibn Ali, were Muhammad's grandsons. His mother, Fatima Umm Abd Allah, was a daughter of Hasan ibn Ali|al-Hasan (the son of Ali). Al-Baqir was born in Medina around 56 AH (676 AD), when Muawiyah I was trying to ensure that his son Yazid I could inherit the caliphate. When Al-Baqir was a child, his family was affected by the Battle of Karbala; he was three or four years old when his grandfather, Husayn, was killed. According to Ya'qubi, al-Baqir was present at Karbala. In his youth he witnessed the struggle for power among the Umayyads, Abd Allah ibn al-Zubayr and a number of Shiite parties, whilst his father maintained a distance from local political activity. Al-Baqir is an abbreviation of Baqir al-'ilm, which means "he who opens knowledge", and al-Baqir is said to have been known for his knowledge. According to Ibn Khallikan, he received the nickname "al-Baqir" (the ample) due to the "ample fund of knowledge" he collected. However, Ya'qubi believed that he was called al-Baqir because he "split open knowledge", examining its depths. [lower-alpha 1] The Shiites believe that Baqir al-'ilm was not an ordinary title, because it was given to him by Muhammad. According to al-Kulayni, Muhammad's only living companion Jabir ibn Abd Allah would sit in the mosque and cry: "Ya baqir al-ilm, Ya baqir al-ilm". Although Medinans thought that Jabir was insane, he assured them that Muhammad had told him: "O Jabir! You will meet a man from my family who will have the same name and the same characteristics as mine. He will split open knowledge extensively." According to al-Kulayni, Jabir ibn Abd Allah met al-Baqir when passing a Quran school. Abd Allah saw that the imam was still a child, and examined him to see if he had the features which Muhammad had described. Jabir asked, "Characteristics of the Messenger of Allah; by Him in whose hands is my soul, O boy, what is your name?" When al-Baqir answered that he was Muhammad ibn Ali ibn al-Husayn, Jabir "approached him, kissed his head and swore by his father and mother that Muhammad had recited greeting upon him." After the death of Ali ibn Husayn Zayn al-Abidin (the fourth Imam), most of the Shiites agreed upon his son al-Baqir as the next imam; a minority favored another son of the imam (Zayd ibn Ali), and became known as Zaidiyyah. According to Ibn Khallikan,[lower-alpha 3] Zaid (Muhammad al-Baqir's brother), appealed for people to support his cause. According to Al-Masudi, he asked for advice from Muhammad al-Baqir; al-Baqir advised him not to rely on the people of Kufa, explaining how they had previously behaved toward the members of his household. Zaid did not listen to his brother's advice, and led the people of Kufa in a fruitless riot. According to Al-Shahrastani,[lower-alpha 4] a dispute had arisen between Muhammad al-Baqir and Zaid because Zaid had been following the Mu'tazilite Wasil ibn Ata. Zaid had also announced that the position of imam was conditional on his appearing publicly to assert his rights. Muhammad al-Baqir replied, "Your faith then is merely in your father, as such, for according to your theory he was not an imam, for he certainly never came forth to assert his claims." Despite his non-involvement in political activities, the Umayyad rulers harassed Muhammad al-Baqir. Many Shia individuals and delegations came to Medina from Kufa to hear al-Baqir's teachings and ask him questions, among which was who had the right to rule. He was also distrusted because of the uprising of his brother Zayd ibn Ali and other relatives. Caliph Hisham ibn Abd al-Malik made a pilgrimage to Mecca, where Mohammed al-Baqir and his son Ja'far al-Sadiq were present. At a gathering, al-Baqir delivered a sermon: "We are the favorite and chosen servants of God, and His vicegerents on the face of the earth. One who obeys us is successful and one who opposes would be evil and wretched." His statements were conveyed to Hisham, who wrote to the governor of Medina when he returned to his court in Syria instructing him to send al-Baqir and his son to Damascus. When they arrived, he kept them waiting for three days; on the fourth he called them to court, where he was practicing archery with his officials. Umm al-Kitab, or The Archetype of the Book, is in the form of a discussion between the imam and three companions. Resembling the Infancy Gospel of Thomas, it illustrates the similarity between imamology and gnostic Christology. A major concept of this work is the description of the numinous experience. Its central motif is the psychological and philosophical explanation of spiritual symbols, with believers instructed to perform acts of self-purification and renewal. Colors are used to symbolize theories and levels of consciousness which one must recognize in oneself. Tafsir al-baqir, or Tafsir Abul Jaroud, is al-Baqir's exegesis of the Quran. Ibn al-Nadim included this book in his list of exegeses of the Quran in his Kitab al-Fihrist, writing that Abul Jaroud Ziyad ibn Abi Ziyad (the head of the Jarudiyya) reported al-Baqir's book. According to Sayyd Hasan al-Sadr, "A group of the reliable Shiites reported the book from him [Abul Jaroud] from the days of his righteousness"; among them was Abu Basïr Yahya bin al-Qasim al-Asadi. Ali bin Ibrahï~m bin Hashim al-Qummi also mentioned it in his book, al-Tafsïr, by the authority of Abu Basïr. "The virtue of knowledge is more lovable with Allah than the virtue of worship." "The believer does not spend an expense more lovable with Allah than saying the truth during consent and anger." "Two kinds of my community have no share in Islam. (They are): the extremists and the fatalists." "Whoever has three qualities or one of them will be in the shade of the throne of Allah: He should treat people with justice. He should do nothing unless he knows whether it pleases or angers Allah. He should seek no fault in his Muslim brother until he frees himself from that fault. For when he frees himself from a fault, he finds another fault in him. It is enough for the person that his own self diverts him from the people." "I admonish you regarding five things: If you are wronged, do not commit wrongdoing to others. If you are betrayed, do not betray anyone, if you are called a liar, do not be furious. If you are praised, do not be jubilant. If you are criticized do not fret and think of what is said in criticism. If you find in yourself what is criticized about you, then you are falling down in the eyes of God. When you are furious at truth, it is a much greater calamity than you falling down in the eyes of the people. And if you are opposite of what is said (in criticism) about you, then it is a merit you acquired without having to tire yourself in obtaining it". "How beautiful it is when goodness succeeds badness; and how unappealing it is when evil succeeds goodness". "Being religious equals being extremely loving, and being extremely loving equals being religious". The cause and the time of the death of the fifth imam are unclear. According to some accounts al-Baqir was poisoned by Ibrahim ibn Walid ibn Abdallah, the nephew of Hisham. According to the Shiite account, the caliph gave Zaid a saddle treated with poison; Zaid gave it to the imam, who used it and died from the poison. Al-Baqir was laid to rest undern the dome in Jannatul Baqee where the imams Hasan ibn Ali and Zayn al-Abidin were buried. ↑ See Ibn Khallikan, trans. de Slane, Vol. II, p. 579 and Ya'qubi, History, Vol. II, p. 384. ↑ See the books of biographies of famous men in Islam such as Irshad, pp.245-253. See also Kitab rijal al-Kashshi by Muhammad ibn Muhammad ibn ’Abd al-’Aziz Kashshi, Bombay, 1317; Kitab rijal al- Tusi by Muhammad ibn Hasan Tusi, Najaf, 1381; Kitab-i fihrist of Tusi, Calcutta, 1281: and other books of biography. ↑ See Ibn Khallikan, trans. de Slane, Vol. III, p. 274. ↑ See Shahrastani, Kjtab al-milal wa'l-nihal(The Book of Religious and Philosophical Sects) edit. Cureton, p. 116 ff. ↑ The Imams, he asserts, are pure and free from the sin; that the world was under their rule, that through them the eye of God mercy falls on men; that if they did not exist, men would perish, and that they should not fear though worthless fellows might deny all this. ↑ An interesting part of which that shows the intellectual and spiritual character of the Imamate goes as follows: A man once asked the Imam, "Was the Prophet heir to all the knowledge of the prophets?" He replied, " Yes"; then he was asked if he had inherited it. He said he had. He was then asked whether he could raise the dead to life, restore sight to the blind, and cleanse the leper. He said, "Yes, by the valour of God Most High." He thus put his hand on the eyes of a man and blinded him, and then brought back his sight. Many more such stories are told. ↑ Shaykh al-Mufid. "The Infallibles - Taken from Kitab al Irshad". Retrieved 2009-05-19. 1 2 A Brief History of The Fourteen Infallibles. Qum: Ansariyan Publications. 2004. p. 117. 1 2 3 4 5 6 7 al-Qarashi, Baqir Shareef. "3". The life of Imam Mohammad al-Baqir. Qum: Ansariyan Publications. 1 2 3 4 5 6 7 8 9 10 11 12 Sharif al-Qarashi, Baqir (1999). The Life of Imam Mohammed al-Baqir; Chapter VI & VIII (PDF). Translated by Jasim al-Rasheed. Qum, Islamic Republic of Iran: Ansariyan Publications. ISBN 964-438-044-4. 1 2 3 4 Tabatabai, Muhammad Husayn (1975). Shiite Islam. Translated and Edited by Seyyed Hossein Nasr. State University of New York Press. pp. 68,179. ISBN 0-87395-390-8. 1 2 3 4 Lalani, Arzina R. (March 9, 2001). Early Shi'i Thought: The Teachings of Imam Muhammad Al-Baqir. I. B. Tauris. pp. 37–38. ISBN 978-1860644344. 1 2 3 4 5 6 7 8 Donaldson, Dwight M. (1933). The Shi'ite Religion: A History of Islam in Persia and Irak. BURLEIGH PRESS. pp. 112–119. ↑ Dakake, Maria Massi (2007). The Charismatic Community: Shi'ite Identity in Early Islam. USA: State Univ of New York Pr. p. 72. ISBN 978-0-7914-7033-6. ↑ Meri, Josef W (2005). Medieval Islamic Civilization: An Encyclopedia (1st ed.). Routledge. p. 523. ISBN 978-0-415-96690-0. ↑ Sell, Edward (1923). Ithna Asharíyya, or The twelve Shi'ah Imams, , pp. 18-19. Publisher:. Madras, India: Christian Literature Society for India. pp. 18–19. ↑ Corbin, Henry (2001). The History of Islamic Philosophy. Translated by Liadain Sherrard with the assistance of Philip Sherrard. London and New York: Kegan Paul International. pp. 75–76. ↑ Muhammadi Reishahri, Muhammad (2010). Mizan al-Hikmah. 3. Qum: Dar al-Hadith. p. 114. ↑ Muhammadi Reishahri, Muhammad (2010). Mizan al-Hikmah. 2. Qum: Dar al-Hadith. p. 425.